If you’ve read any of our posts at Lavender Rocks then you will know that we just LOVE essential oils around here. Especially Lavender. Because well, it rocks obviously! But we need to have a little chat about where you are currently buying your oils. Because not all oils are created equal. And some oils could be dangerous for you and your family. I love Amazon, I shop online there multiple times a week and I buy all of my oily supplies from Amazon. Amber bottles and jars and even diffusers. But essential oils? No way. Let’s take a closer look at our favourite, “swiss army knife” of essential oils. Lavender. It has a lot of uses and is therefore one of the most commonly used oils. But it’s also one of the most adulterated oils on the market. What on earth does “adulterated” mean? When an oil has been adulterated it means it’s been tampered with in some way. So it might have been spiked with synthetics, or stretched solvents to make it go further. It also might not even be Lavender essential oils in the bottle! When is Lavender oil not really Lavender oil? The real Lavender oil (Lavandula anguvstifolia) is obtained by steam distilling the flowers of the lavender plant. There is another type of oil called Lavandin which is also known as Dutch Lavender. This is often used in perfumes and crafting and sometimes finds itself in bottles labelled Lavender Essential Oil, when it really isn’t. Now I’m not saying that all essential oils sold on Amazon or in drugstores are dangerous. Just that you need to take a lot of care when you buy them. You need to closely check the labels to see what’s in the bottle, and you should really find out exactly how the oils have been harvested, distilled and put into the bottle. And honestly, who has time to do that? I don’t have time to be checking labels and researching companies before I buy my oils. I’ve got two children to look after, a home to manage and a business to run! Knowing where my oils come from and what’s in the bottle is the main reason I chose Young Living as the only place I buy my essential oils. I don’t have to worry about labels and background checks. I just decide which oils I need and order them! Young Living are open and honest about where their oils come from. They have a promise to families that from the seeds they plant to the moment the oil is sealed in the bottle they take care to maintain the beneficial properties of the oil and not adulterate it in any way. You can read more about that promise here or watch the video below. Heck if you wanted to you could even go and visit a farm to see with your own eyes how they look after those oils. That’s how open they are. I trust Young Living to do what’s right for my family. And therefore I am happy to recommend them to you too. When you buy your oils from the supermarket or drugstore all you get is a bottle of oil. But when you buy your oils from Young Living you become part of this huge community of people from all over the world who are passionate about essential oils. I love my oils and I use them every single day. But there are so many things I still don’t know. So many clever ways to use these oils that I haven’t discovered yet. And I love that I am part of this fabulous Oily Family that I can learn from and share with. Click here to start your oily journey today! 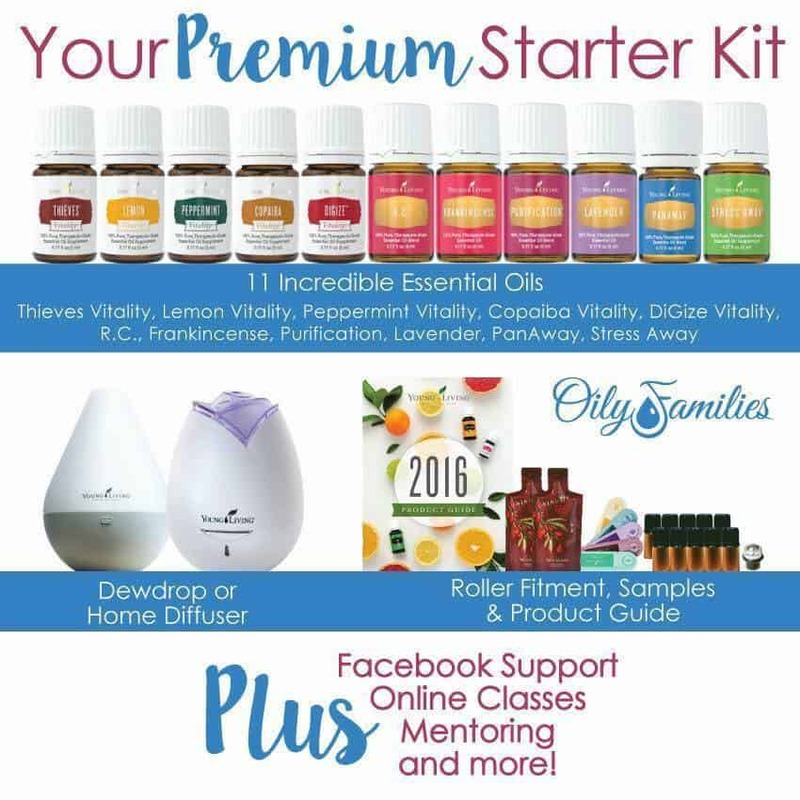 The Young Living Starter Kit is a great way to start your oily journey (and excellent value too)! When I started out on my oily journey I didn’t buy just one oil. Nope. I bought a box full, because I invested in the Young Living Premium Starter Kit. It had everything I needed to get started, including eleven bottles of oils and a diffuser! There’s a really useful guide in the box too which shows you how to put all those oils to good use straight away. The other great reason to treat yourself to a Starter Kit is that you automatically become a “wholesale member”. Which means your future purchases from Young Living will all be at 24% off the retail price! You don’t have to buy anything else (or sell anything) but if you do you get a 24% discount on every purchase! What’s in the Young Living Starter Kit? Do you want a closer look at what’s inside the box? You get that pack of 11 essential oils (100-120 drops of oil per bottle). Here’s a super quick video that will walk you through the process of choosing your kit and setting up your account. Select your diffuser. I love the Dewdrop and it’s a great one to start out with. Optional – at this point you can choose Automatic Monthly Delivery. It’s the member’s reward program “Essential Rewards”. It’s free to join and you collect points on each purchase that you can then redeem for free products. You can switch up your order every month and cancel at any time. You can do it now or wait until later to join. I would choose the Thieves Essential Rewards kit because it has everything you need to clean your house toxin free as well as some fabulous personal care products. Continue Enrolment. If there are oils you want to add to your order right now click the Add More Products button. Otherwise click next to move on to set up your account. Confirm your order: Don’t forget to confirm your order on the last page or you’ll miss out on your oils! Click here to grab your starter kit! That’s it! In a few days I’ll drop you an email to welcome you to our Oily Family and send you the details of our Facebook group so you can access the wealth of help and information we have there. Congratulations on starting your oily journey! Does signing up mean that I will have to sell oils to people? Nope! You are not required to sell anything at all to anyone. When you become a wholesale member, you get a special link that you can share with friends and get credit from their purchases, but there are no minimum sales amounts at all. If you ARE interested in the business side then we have ALL the resources to help you get started with earning an income from Young Living as well. But before getting started with the business, I highly recommend taking some time with your starter kit to get to know the oils and fall in love! Once you have received your kit I’ll invite you to join our private Facebook group that’s specifically for questions about essential oils! The answer to this one was surprising to me when I first got my starter kit! Young Living actually has an entire line of personal care products, supplements, meal replacements, energy drinks, and more! Almost every product incorporates essential oils (for example, frankincense is absolutely wonderful in facial products), and they create new products almost every year!